Dolkorom Talk PreviewThe first Dolkorom Talk event aims to get people talking about their soul foods. Dolkorom Talk is a new series of events designed to unite people from all cultures living on Jeju through the themes of food, art, and living. It will take the form of a series of talks, performances, exhibitions and networking parties. These will total three events and will take place on September 9, October 21, and December 2, 2016. This first event will be held on Friday, September 9 from 6 till 9pm at Jeju Venture Maru’s Creative and Economic Innovation Center J-Space. 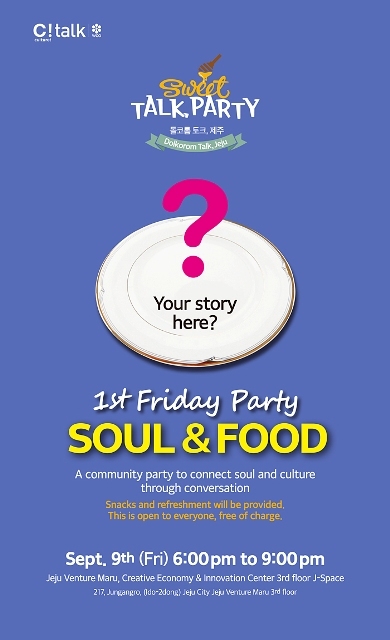 This event is titled Sweet Talk and aims to introduce the concept of Soul Food. As Dolkorom is the Jeju language word for perfectly sweet, it is only fitting that the first event of the series is about food. Soul Food is the idea that everyone has a type of food that really speaks to their soul. This could be anything from a simple snack you used to eat when you were young, to a one off meal with friends you will never forget. It is hoped that by attending the event and sharing soul foods stories and recipes, it will help to create a bond between the people of different cultures attending the event. It will also be a chance to hear from three Jeju chefs making a real difference in the Jeju food scene. They will talk about their cooking and, of course, share their own individual soul food story. The three chefs attending the event are Hong Jung-pyo from bakery and cafe Add Time, Nabil Merbah from French restaurant Le Coin and Park So-yeon from food education company Cook ‘n’ Farmer. At the Sweet Talk event, each chef will introduce their soul food and explain why it is important to them. The first speaker is baker Hong Jung-pyo. He originally came from Seoul to Jeju with a dream of making the freshest bread using the best local ingredients. His bakery and cafe Add Time opened in 2008 under the concept of ‘local bread’. Because of this he uses natural yeast and wheat sourced from Jeju to make all his delicious bread. The slow fermentation process he uses to make his bread means that it is heavier and more delicious than it would otherwise be. As well as this he never uses chemical additives in his products to keep them as natural as possible. Hong Jung-pyo’s presentation is titled 'Natural barmy Jeju wheat bread'. The second speaker is French chef Nabil Merbah. He comes all the way from France and his restaurant, Le Coin, brings a little bit of French style to the City Hall area of Jeju City. His cozy restaurant with its frequent rooftop parties chilled out atmosphere and traditional French food is certainly a perfect fit for an event titled soul food. 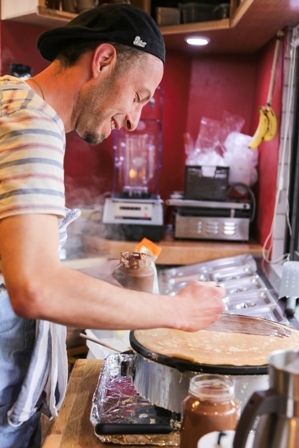 Le Coin specializes in French style treats such as crepes and galettes. Available in both sweet and savory flavors, these authentic French treats being made on the other side of the world are almost the very definition of soul food. As well as the food on offer he also keeps his restaurant stocked with a steady stream of French drinks such a cider, beer and mulled wine. Nabil’s presentation is titled 'Sweet French desserts in Jeju'. Third speaker, Cook ‘n’ Farmer’s Park Seo-yeon is on a mission to make sure that farmers get the true recognition they deserve for their work. She does this through a range of educational workshops and hands-on community activities that help people cherish not only the taste of their food but also the value of life. She is dedicated to telling the story of the food she sells and especially thinks that educating the younger generation about their food is important. This lead to a number of stories including the interestingly titled ‘Story of the horse dung cookies’ that she will present at the Dolkorom event. 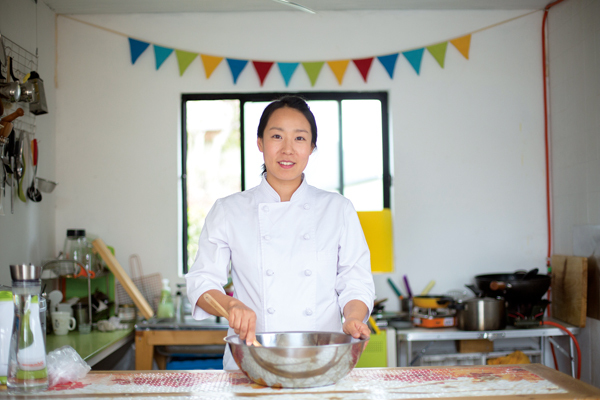 As well as her educational workshops and activities, she also sells a range of homemade bread and jams using ingredients native to Jeju. Park Seo-yeon’s presentation will be titled 'Story of the horse dung cookies'. While the three presentations will be the main event, there will also be a range of other performances to keep participants thoroughly entertained throughout the evening. A video from director Kim Seung-hwan will start the evening. Later on, there will also be art performances including a jazz music performance featuring Kyle Ohlson on saxophone, Lazaro Laz Rodriguez on drums and Ed Thompson on vocals and a dance performance titled ‘Dance of peace’ with Jinyeo from the Jeju dance art center. As well as this there will be plenty of time for participants at the event to talk, network and, of course, discuss their own soul foods. It is hoped that participants to the event will have a great time and also help create a lasting bond between Jeju's global community.